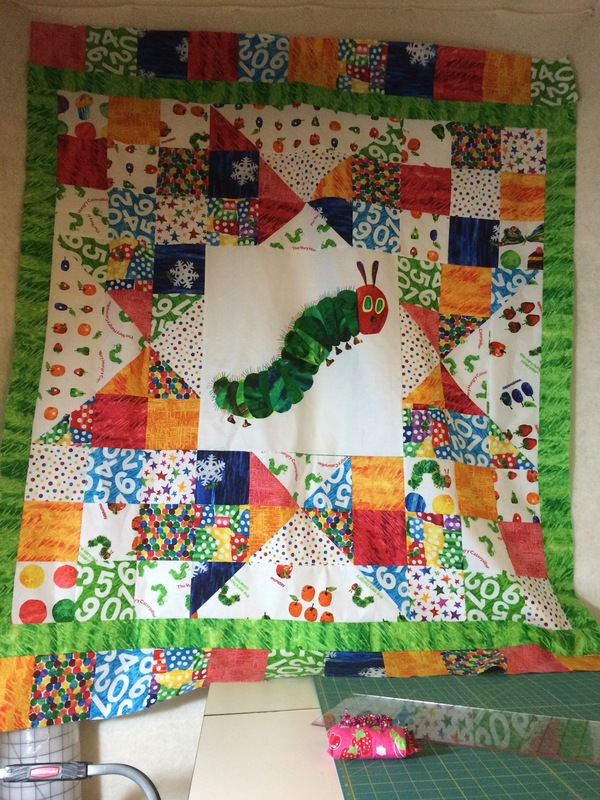 I think I mentioned here during one of my stash reports that I bought a quilt kit for A Very Hungry Caterpillar quilt. I meant it as a gift to a friend having a baby. Well her baby shower is coming up and thankfully I got the quilt top finished up last night. This was my first time making a quilt from a kit and I really liked it. I bought it from FatQuarterShop.com. I had some trouble with the flying geese units but I managed to fix them and I’m glad I did. It made piecing the top together so much easier. Now all that is left on this quilt is piecing together the back, quilting & binding. Luckily I already have the binding cut & ready to go. The kit came with an extra panel. The caterpillar panel went on the front and I’m going to use the bonus butterfly panel for the back along with the scraps I have left from the front.